Background/Aims: Recently, water exchange (WE) instead of water immersion (WI) for colonoscopy has been proposed to decrease pain and improve adenoma detection rate (ADR). This systematic review and meta-analysis is conducted to assess whether WE is superior to WI based on the published randomized controlled trials (RCTs). Materials and Methods: We searched studies from PubMed, Cochrane Central Register of Controlled Trials, EMBASE, and MEDLINE. Only RCTs were eligible for our study. The pooled risk ratios (RRs), pooled mean difference (MD), and pooled 95% confidence intervals (CIs) were calculated by using the fixed-effects model or random-effects model based on heterogeneity. Results: Five RCTs consisting of 2229 colonoscopies were included in this study. WE was associated with a significantly higher ADR than WI (RR = 1.18; CI = 1.05–1.32; P = 0.004), especially in right colon (RR = 1.31; CI = 1.07–1.61; P = 0.01). Compared with WI, WE was confirmed with lower pain score, higher Boston Bowel Preparation Scale score, but more infused water during insertion. There was no statistical difference between WE and WI in cecal intubation rate and the number of patients who had willingness to repeat the examination. Furthermore, both total procedure time and cecal intubation time in WE were significantly longer than that in WI (MD = 2.66; CI = 1.42–3.90; P < 0.0001; vs MD = 4.58; CI = 4.01–5.15; P < 0.0001). Conclusions: This meta-analysis supports the hypothesis that WE is superior to WI in improving ADR, attenuating insertion pain and providing better bowel cleansing, but inferior in time and consumption of infused water consumption during insertion. Colonoscopy is important for diagnostic purposes and cancer surveillance and is almost irreplaceable for cancer screening in view of its potential to reduce the morbidity of CRC.,, Besides, precursor lesions and early cancers can be detected early and removed by colonoscopy, which in turn could lead to the decline of mortality from colon cancer. Otherwise, water-aided colonoscopy, in which water is infused in lieu of gas insufflation to inflate the lumen during the insertion phase, has received renewed attention in the literature in recent years. Several meta-analysis of randomized controlled trials (RCTs) comparing AI with water-aided colonoscopy suggested that the latter caused less pain during insertion than the former., Water-aided colonoscopy can be categorized into two types, namely water immersion (WI) and water exchange (WE). WI is characterized by the infusion of water to facilitate cecal intubation and suction removal of residual water predominantly during withdrawal,,, while WE is a recent modification of WI and is characterized by the clean water insertion to the cecum and removal of residual water predominantly during this phase.,, In 2011, Leung et al., first revealed that WE rather than WI was consistently associated with a greater attenuation of pain during insertion, which aroused global interest in the subject. Thereafter, a growing number of RCTs comparing WE and WI were performed to demonstrate that the former is superior to the latter one, both in lowering pain score and increasing adenoma detection rate (ADR). The aim of our systematic review and meta-analysis is to certify whether WE is a more effective diagnostic tool than WI, in terms of procedure-related and patient-related colonoscopic outcome. Recent randomized clinical trials relevant to the comparison of WE and WI to aid insertion of colonoscopy were identified by searching PubMed, Cochrane Central Register of Controlled Trials, EMBASE, and MEDLINE. The search period extended up to December 2017. The combinations of keywords used were (“water exchange” or “water immersion” or “water-assisted” or “water-aided” or “water related”) and (“colonoscopy” or “colonoscopic”). References from all retrieved studies as well as review articles on this topic were scrutinized for more eligible trials. In addition, the ClinicalTrials.gov database was screened for information regarding unpublished trials and complementary information on published trials. Next, two reviewers independently assessed full papers of the selected references according to inclusion or exclusion criteria. Disagreements were resolved by discussion or by a third review author if needed. Only RCTs comparing WE with WI during the insertion phase of colonoscopy were considered. Language and publication status of the trials included were not restricted. We included 18-to-85-year-old patients undergoing colonoscopy regardless of the procedural indications (screening, diagnostic, or treatment). Selected articles were required to have at least one of the following primary or secondary outcomes: (1) cecal intubation rate; (2) ADR; (3) right colon ADR; (4) total procedure time; (5) cecal intubation time; (6) withdrawal time; (7) pain score during insertion; (8) infused water during insertion; (9) willingness to repeat the examination; (10) Boston Bowel Preparation Scale (BBPS), an indicator to evaluate the quality of bowel preparation. Exclusion criteria included: (1) 10 or fewer patients; (2) data of water-assisted colonoscopy could not be discriminated between WE and WI; (3) and animal studies. We also excluded six meeting abstracts since these were published online and the published papers were included in our systematic review and meta-analysis. Two reviewers independently abstracted data from each included study using a standardized abstraction form. The data extraction was discussed, with decisions documented by a third reviewer if there was interobserver disagreement. The following data were extracted, verified, and recorded: characteristics of participants (number of patients enrolled [“total” and “per study arm” respectively], nationality, age, number and ratio of female and male, body mass index, history of previous abdominal surgery); characteristics of interventions (WE, WI, indications, sedation model, level of experience, and water temperature); and primary or secondary outcome measures (patient-related and procedure-related outcomes). 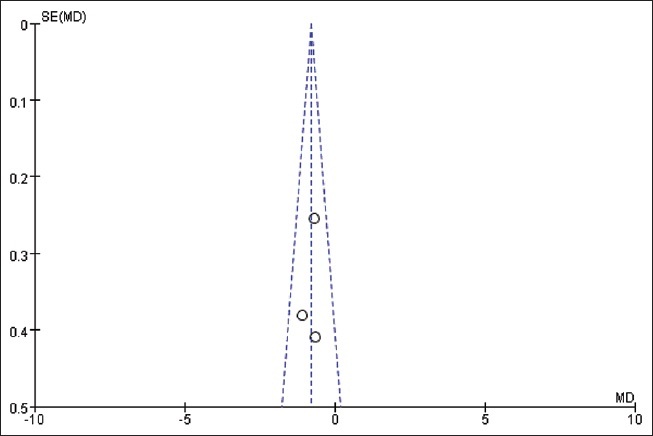 Potential publication bias was investigated using a funnel plot. The methodological quality of each included study was evaluated using the risk of bias as described in Cochrane Handbook for Systematic Reviews of Interventions. 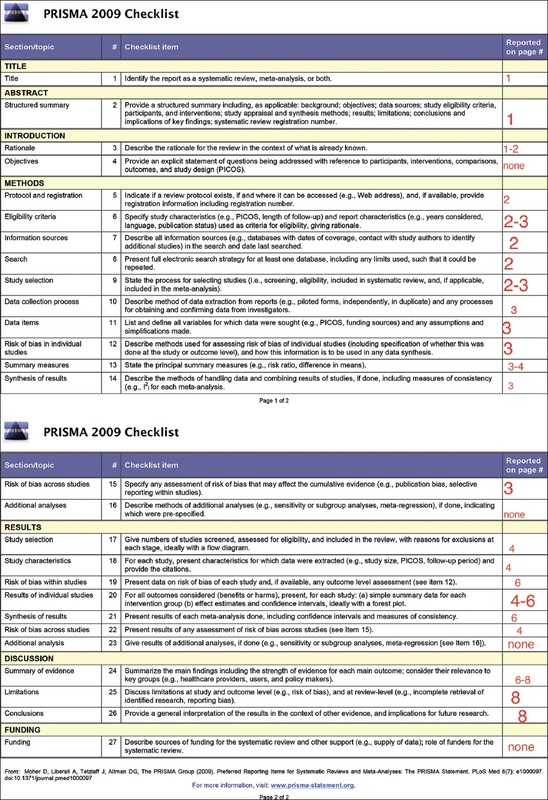 The seven-item questionnaire was assessed on the following guidelines: (1) random sequence generation; (2) allocation sequence concealment; (3) blinding of participants and personnel; (4) blinding of outcome assessment; (5) incomplete outcome data; (6) selective reporting; (7) other bias. Each item has the response “high risk,” “low risk,” or “unclear risk.” Assessment of studies was performed by two reviewers independently and consensus was reached after discussion if there existed disagreement. The Review Manager (Cochrane Collaboration, Copenhagen, Denmark) and Stata version 14.0 (StataCorp, College Station, TX, USA) were used to analyze the data. The pooled risk ratio (RR) and 95% confidence interval (95% CI) were calculated for dichotomous outcomes. For continuous outcomes, the pooled mean difference (MD) and 95% CI were calculated as appropriate. 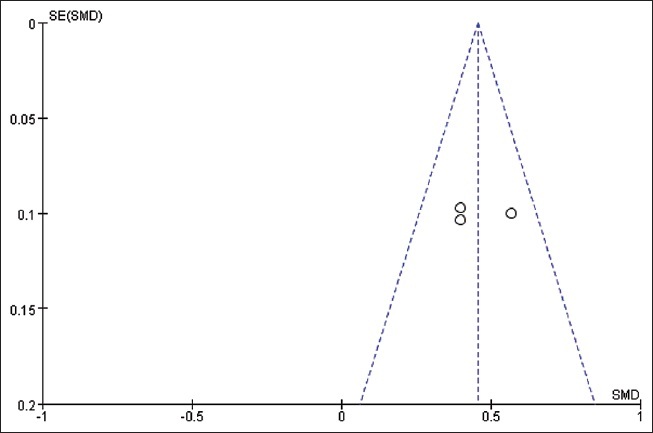 Heterogeneity was assessed using the Chi-square test, and the data were considered heterogeneous if P < 0.05. The I2 statistic was used to estimate the degree of heterogeneity. This measure describes the percentage of total variation across studies that results from heterogeneity rather than chance. A value of 25, 50, and 75% was considered to indicate low, moderate, and high heterogeneity, respectively. 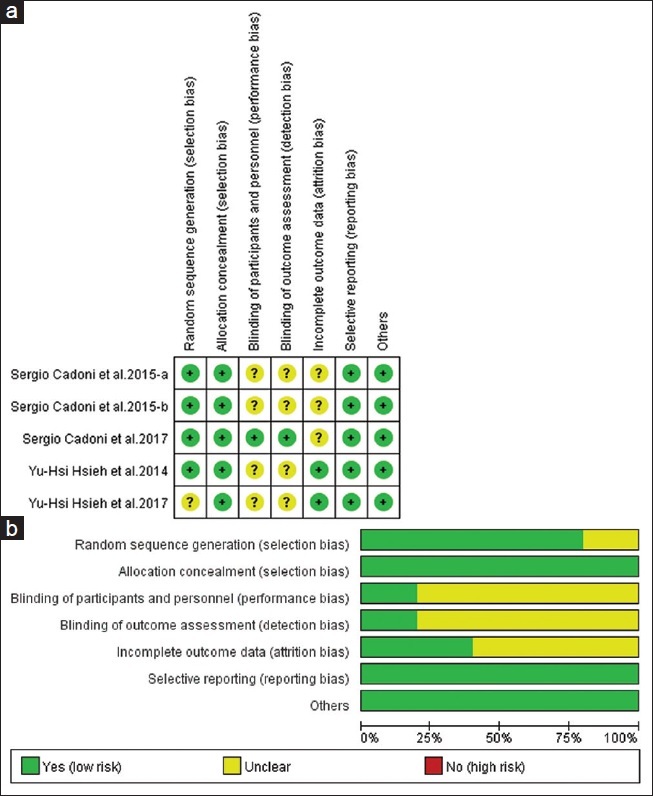 Data from individual trials were combined for meta-analysis if the interventions, patient groups, and outcomes (outcome reporting and scales of outcome measures) were sufficiently similar (to be determined by consensus). The fixed-effects model was used to pool data in the absence of heterogeneity. The random-effects model was used if significant heterogeneity was detected. Overall, 106 potentially matched articles were identified through database search until December 2017. Four additional articles were found through the ClinicalTrials.gov. [Figure 1] shows the process of paper selections. Five trials were finally included for meta-analysis. The characteristics of the studies are listed in [Table 1]. 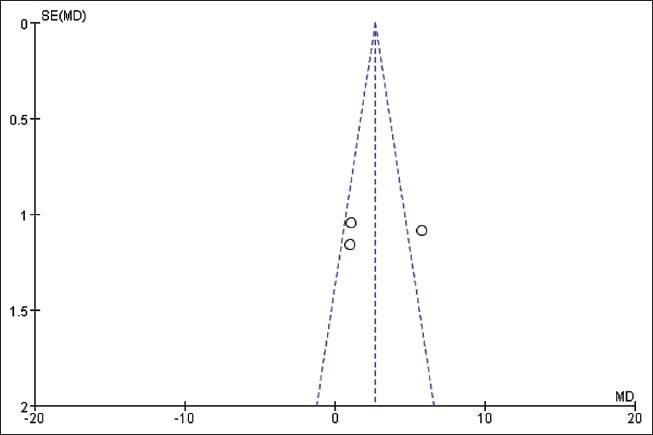 Quality of the included studies, as assessed using the risk of bias assessment tool described in the Cochrane Handbook for Systematic Reviews of Interventions, appears to be moderate because of potential detection bias in some articles [Figure S1]. These five articles ,,,, were all RCTs, three conducted in Italy, two in Taiwan, Republic of China, including a total of 2229 participants. The number of male and female participants was similar. The mean age of the study participants ranged from 53.0 to 61.4 years. Screening and diagnosis were the most frequent indications for colonoscopy. Five studies ,,,, with 2229 colonoscopies compared the cecal intubation rate between WE and WI. Irrespective of the colonoscopic method, mean cecal intubation rate ranged from 88.0 to 99.0%. 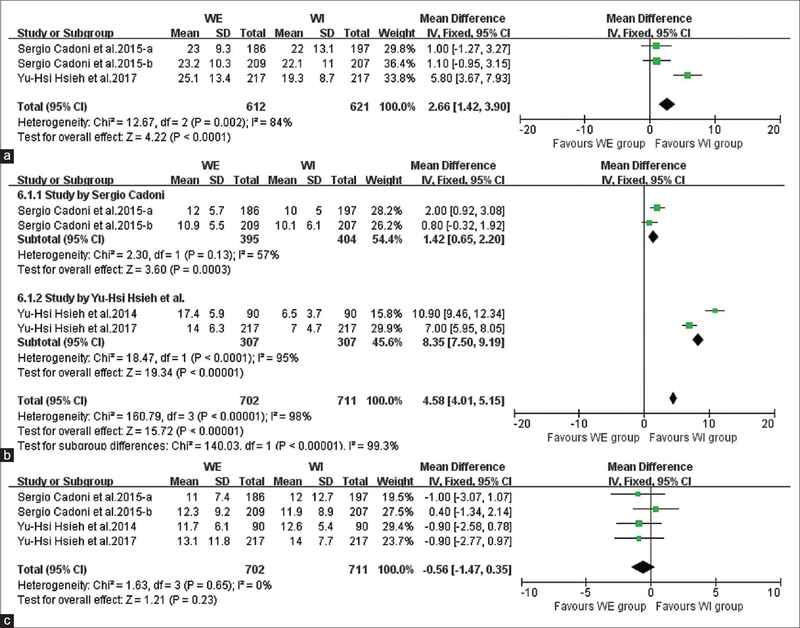 In the final meta-analysis, cecal intubation rate was similar between WE and WI [RR = 1.01; CI = 1.00–1.03; P = 0.14; I2 = 15%] [Figure 2]a.
ADR was assessed in three trials.,, The meta-analysis involved a total of 1430 colonoscopies and the statistical results showed that WE had a significantly higher ADR than WI [RR = 1.18; CI = 1.05–1.32; P = 0.004; I2 = 0%] [Figure 2]b. Three trials ,, evaluated the right colon ADR using the proportion of patients with at least one adenoma. The statistical results showed that WE had a higher right colon ADR [RR = 1.31; CI = 1.07–1.61; P = 0.01; I2 = 0%] [Figure 2]c.
Total procedure time was reported in four included trials.,,, The article by Cadoni et al. was excluded because it assessed data using median and interquartile range (IQR) instead of mean and SD. Statistical data revealed that total procedure time in WI was significantly longer than that in WE [MD = 2.66; CI = 1.42–3.90; P < 0.0001; I2 = 84%] [Figure 3]a. Five studies ,,,, reported outcomes in terms of cecal intubation time. 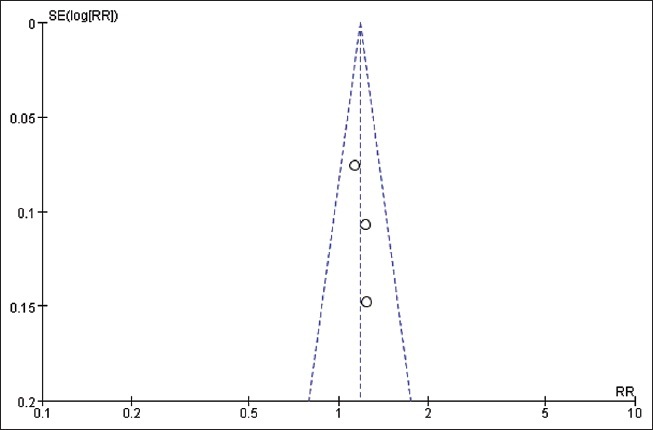 Only four trials ,,, reported cecal intubation time as a mean average with standard deviation (SD). The large interstudy differences in the mean intubation time might contribute to the high heterogeneity in the pooled analysis of the mean difference (I2 = 98%). 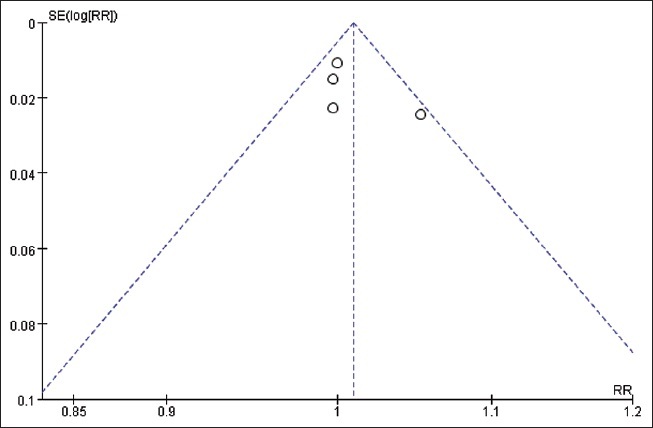 Meta-analysis of the data showed a reduction in cecal intubation time by 4.58 minutes in WI compared with WE [MD = 4.58; CI = 4.01–5.15; P < 0.00001; I2 = 98%] [Figure 3]b. Subgroup analysis also revealed a significant difference in cecal intubation time between two endoscopy centers (MD = 1.42; CI = 0.65–2.20; P = 0.0003; I2 = 57% vs MD = 8.35; CI = 7.50–9.19; P < 0.00001; I2 = 95%). All of these five studies ,,,, had evaluated the withdrawal time. The research by Cadoni et al. was eliminated because it performed the results in median and IQR instead of mean and SD. Finally, with four studies included, there was no evidence of difference in the withdrawal time between WE and WI [MD = −0.56; CI = −1.47 to 0.35; P = 0.23; I2 = 0%] [Figure 3]c.
Four studies ,,, investigated difference in pain score measured by 0 to 10 numeric rating scales (0 means no pain, 10 is the most severe or worst pain), while Cadoni et al. was excluded without performing the results of SD. 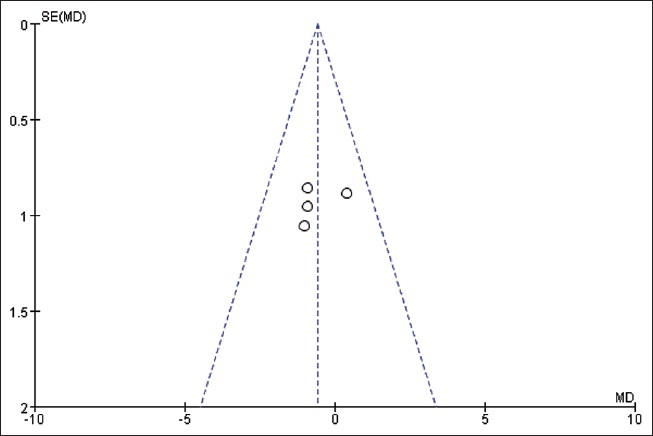 Pain score was significantly lower in WE compared with WI [MD = −0.79; CI = −1.16 to − 0.42; P < 0.0001; I2 = 0%] [Figure 4]a. Five trials ,,,, reported volume of infused water during insertion but only two of them , performed the results as a mean average in milliliter with SD. The volume of infused water during insertion in WI was smaller than that in WE [MD = 610.28; CI = 546.98–673.58; P < 0.00001; I2 = 47%] [Figure 4]b. To assess the satisfaction of the two examinations, four studies ,,, evaluated the number of patients who had willingness to repeat the examination. 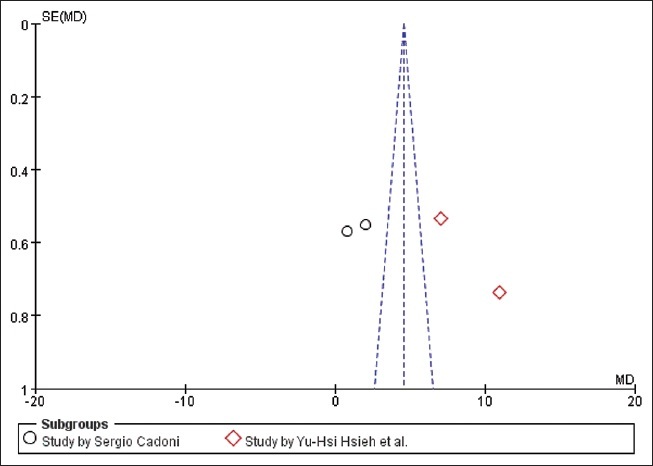 This meta-analysis involved 893 and 902 patients who had experienced WE and WI, respectively. 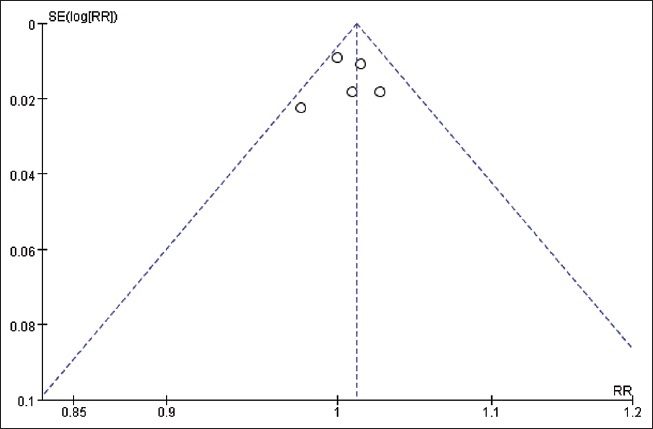 There was no difference between WE and WI [RR = 1.01; CI = 0.99–1.03; P = 0.33; I2 = 36%] [Figure 4]c.
Quality of bowel cleansing was assessed during withdrawal in four studies,,,, with Cadoni et al. using median and IQR instead of mean and SD. Thus, only three RCTs were suitable to make an analysis. 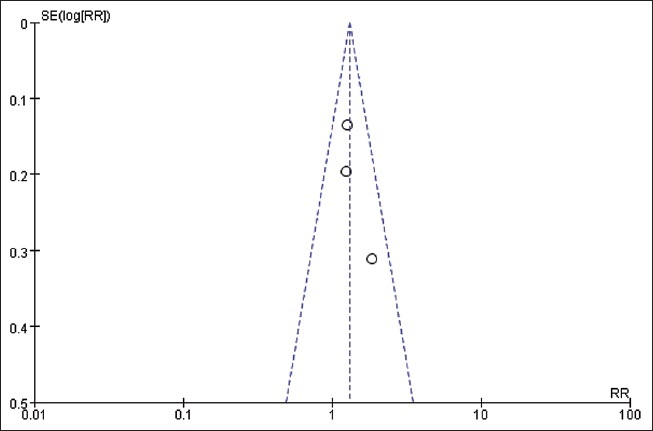 The score of each trial was presented in [Figure 4]d. Our meta-analysis showed that WE had significantly higher BBPS than WI [MD = 0.45; CI = 0.34–0.57; P < 0.00001; I2 = 0%] [Figure 4]d.
Quality of evidence of included RCTs appeared to be moderate or even low because of potential bias in some studies. However, we did not detect significant publication bias. Only five RCTs were included in our meta-analysis and the power of the tests was too weak to distinguish chance. Thus, we do not show these data [Figure S2],[Figure S3],[Figure S4],[Figure S5],[Figure S6],[Figure S7],[Figure S8],[Figure S9],[Figure S10],[Figure S11],[Figure S12],[Table S1]. Since Leung et al. first came to the conclusion that WE was superior to WI for colonoscopy, a growing number of RCTs have attempted to make comparisons between WE and WI. In this systematic review and meta-analysis, we find that WE rather than WI during the insertion phase of colonoscopy is significantly associated with higher ADR (particularly in right colon), higher BBPS, and lower abdominal pain score. On the contrary, WE colonoscopy is characterized by a longer insertion phase and demanding more infused water. Cecal intubation failures are always attributed to intolerable pain, diverticular substenosis, looping, acute angles, and obstructing cancer.,, In our study, the analyzed results confirm cecal intubation rate is not significantly different between the two procedures. The reason may be that colonoscopists are all well-trained and the water could help them clean and expand bowel. Recent studies observed that WE was helpful in salvaging most of the failures and improved the success rate of cecal intubation in potentially difficult colonoscopies.,, Nevertheless, Vemulapalli et al. demonstrated that the use of WI offered the advantages of allowing cecal intubation in patients with known redundant colons by requiring an external stiffener less often. Therefore, colonoscopists are supposed to choose optimal colonoscopic methods depending on the difficulty and complexity of colonoscopies in clinical practice. Secondly, the most important aspect to assess a colonoscopy is ADR, and data shows that 23–58% of interval CRCs are ascribed to missed lesions. Our pooled data shows a superior ADR through WE rather than WI. The results show that WE had a higher ADR than WI in total and right colon ADR (cecum and ascending colon). Our results of BBPS show that WE performs better for colon cleanliness overall and may have contributed to the increase in ADR. The underwater view might also be helpful to discover polyps hidden behind a fold or an angulation because suction-induced collapse of the colon by WE might change the contour of the colon and make a fold or an angulation less accentuated. Researchers had reported a trend of more missed adenomas in the right side of the colon compared with the left  which might be of clinical significance. However, we find that the increase of ADR is likely due to longer examination time. Hsieh et al. reported a 200% increase in cecal intubation time for the WE, when compared with WI. Rex et al. pointed out that the increased ADR in the WE may be the result of more time spent on insertion rather than the method itself. Nonetheless, we believe that is insufficient data to make a statistical analysis of the association between ADR and cecal intubation time in our meta-analysis. As far as time consumption is concerned, there is no difference in withdrawal time. However, WI demands less time for cecal intubation and the total procedure. It is mainly due to the time consumed in suctioning of the effluent. WE, with split-dose bowl preparation, needs to clean residual gas and dispose off bubbles to avoid its interference with inspection. To assess the satisfaction of WE and WI, we compared the pain score, and the patients' willingness to repeat the examination. The results show that WE could cause less pain but with no difference in the willingness of patients to repeat the examination. There are several plausible explanations for the pain produced during the examination. Loop formation at the sigmoid colon is associated with insertion pain. Infusion of water could straighten the sigmoid and reduce loop formation at the rectosigmoid junction. Besides, WE avoids lengthening of the colon and the aspiration of residual air pockets during WE further shortens the colon, which results in a shorter length of the instrument needed to achieve cecal intubation, and fewer attendant maneuvers, such as position change or abdominal pressure, to manage looping. Thus, WE offers the best chance to complete more comfortable colonoscopies without the need of sedation. Previous studies have demonstrated that the focused task of searching for lesions could potentially be distracted by withdrawal cleaning, leading to a lower yield of detected lesions.,,, The current data confirm that MD in water volume between WE and WI is even greater, by about 610.28 ml. More infused water is consumed to clear the view and minimize distension during this phase, which could avoid distraction of withdrawal cleaning which may affect WI and AI. Thus, this could explain that WE does enhance the performance of investigators identifying lesions in the right colon at excellent segmental BBPS score. The strength of the present systematic review and meta-analysis is that we included only RCTs and the methodological quality of most of them was high. However, the limitations of our study should not be ignored. The main weakness is that the eligible studies varied in several aspects, including difference in inclusion and exclusion criteria, characteristics of patient cohorts, sedation model, technical modality, colonoscopic skills level, and it is possible that methodological differences might have confounded the differences recorded across subgroups of trials. A further limitation is that endoscopists, assistant nurses, and outcome assessors in some trials were not blinded, and as a consequence, the risk of bias is high and cannot be excluded. More importantly, all five clinical trials were designed and carried out by two investigative teams. Although it leads to low heterogeneity, yet the data may lack appeal and it may be difficult for other endoscopic centers to repeat the results. Besides, a sensitivity analysis could not be performed since only five studies met the inclusion criteria. Thus, we suggest that more multi-center, double-blinded RCTs should be carried out to confirm whether WE is superior to WI. 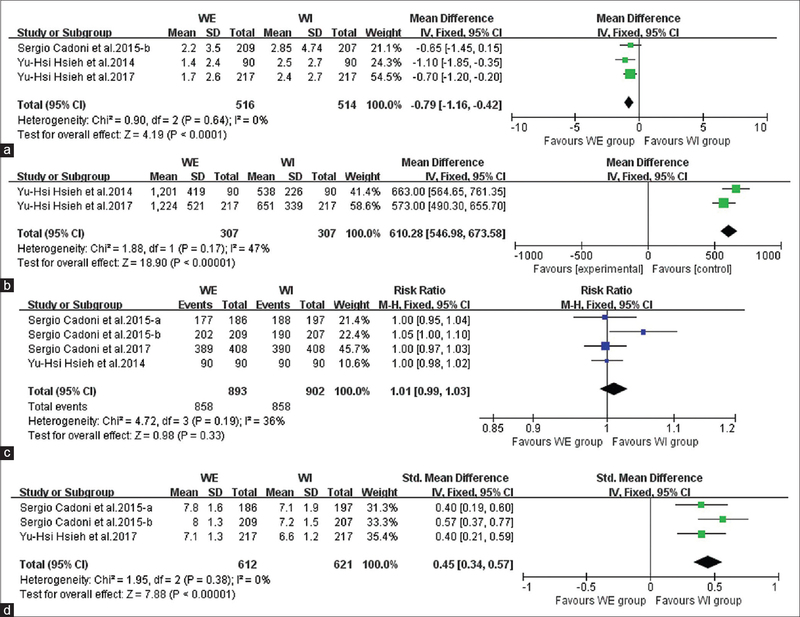 In conclusion, this is the first systematic review and meta-analysis to compare WE and WI colonoscopies. The attenuation of pain and higher detection of lesions suggest that WE is a superior insertion technique. Comparative data appeared to reveal that WE rather than WI was associated with longer cecal intubation time and larger infused water volume. Besides, WE is inferior to WI in bowel cleansing to help enhance the performance of investigators identifying lesions. 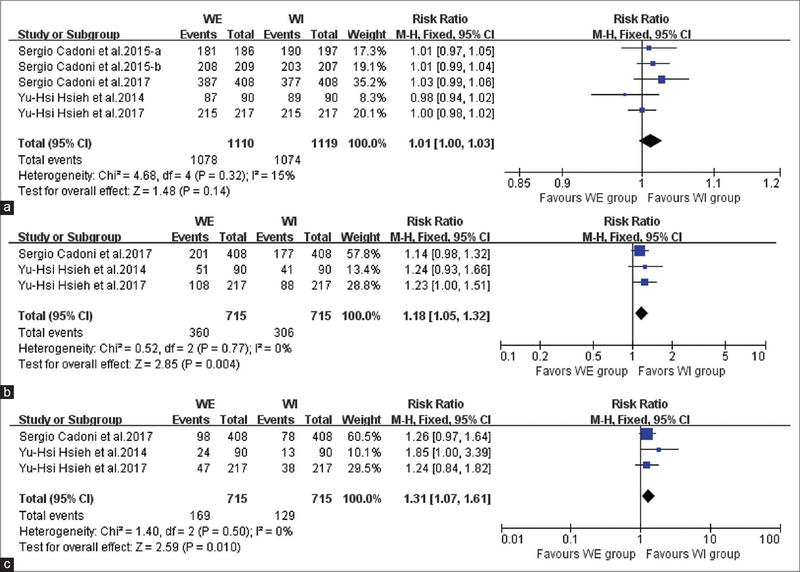 Because of few RCTs from various endoscopic centers eligible in our study, the benefits of WE compared with WI should be further evaluated by additional multicenter and multinational RCTs for future meta-analysis. This study was funded by National Key R and D Program of China during the Thirteen Five-year Plan Period (Program Number: 2016YFC1302800) and CAMS Innovation Fund for Medical Sciences (Program Number: 2016-I2M-1-001). Ferlay J, Soerjomataram I, Dikshit R, Eser S, Mathers C, Rebelo M,et al. Cancer incidence and mortality worldwide: Sources, methods and major patterns in GLOBOCAN 2012. Int J Cancer 2015;136:E359-86. Force USPST. Screening for colorectal cancer: U.S. Preventive Services Task Force recommendation statement. Ann Intern Med 2008;149:627-37. Vleugels JL, van Lanschot MC, Dekker E. Colorectal cancer screening by colonoscopy: Putting it into perspective. Dig Endosc 2016;28:250-9. Cadoni S, Leung FW. Water-assisted colonoscopy. Curr Treat Options Gastroenterol 2017;15:135-54. Leung FW. Water exchange may be superior to water immersion for colonoscopy. Clin Gastroenterol Hepatol 2011;9:1012-4. Hu D, Xu Y, Sun Y, Zhu Q. Water infusion versus air insufflation for colonoscopy: A meta-analysis of randomized controlled trials. Tech Coloproctol 2013;17:487-96. Cadoni S. Methods and techniques for unsedated colonoscopy: A systematic review. J Interv Gastroenterol 2014;5:25-31. Al-Awabdy B, Wilcox CM. Use of anesthesia on the rise in gastrointestinal endoscopy. World J Gastrointest Endosc 2013;5:1-5. Leung FW. Water-aided colonoscopy. 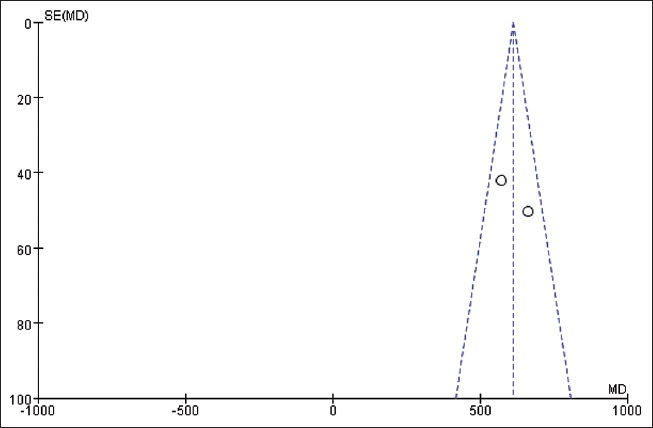 Gastroenterol Clin North Am 2013;42:507-19. Rabenstein T, Radaelli F, Zolk O. Warm water infusion colonoscopy: A review and meta-analysis. Endoscopy 2012;44:940-51. Leung FW, Amato A, Ell C, Friedland S, Harker JO, Hsieh YH,et al. 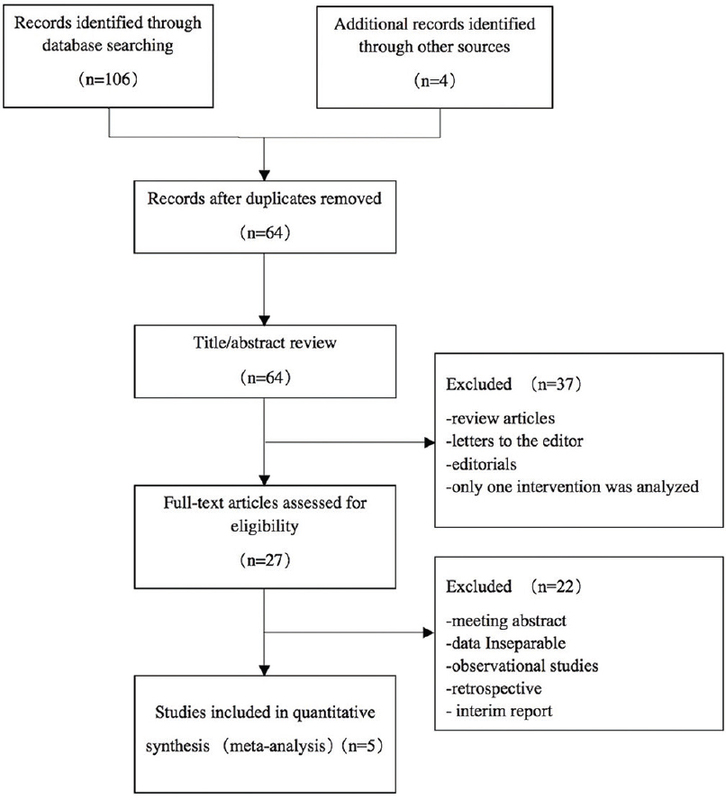 Water-aided colonoscopy: A systematic review. Gastrointest Endosc 2012;76:657-66. Pohl J, Messer I, Behrens A, Kaiser G, Mayer G, Ell C. Water infusion for cecal intubation increases patient tolerance, but does not improve intubation of unsedated colonoscopies. Clin Gastroenterol Hepatol 2011;9:1039-43.e1. Leung F, Harker J, Leung J, Siao-Salera R, Mann S, Ramirez F,et al. Removal of infused water predominantly during insertion (water exchange) is consistently associated with a greater reduction of pain score—review of randomized controlled trials (RCTs) of water method colonoscopy. J Interv Gastroenterol 2011;1:114-20. Higgins J, Green SE. Cochrane Handbook for Systematic Reviews of Interventions Version 5.1.0. The Cochrane Collaboration (Eds). Naunyn-Schmiedebergs Archiv für experimentelle Pathologie und Pharmakologie 2011;2011:S38. Hsieh YH, Tseng CW, Hu CT, Koo M, Leung FW. Prospective multicenter randomized controlled trial comparing adenoma detection. Gastrointest Endosc 2017;86:192-201. Cadoni S, Sanna S, Gallittu P, Argiolas M, Fanari V, Porcedda ML,et al. A randomized, controlled trial comparing real-time insertion pain during colonoscopy confirmed water exchange to be superior to water immersion in enhancing patient comfort. Gastrointest Endosc 2015;81:557-66. Cadoni S, Falt P, Gallittu P, Liggi M, Mura D, Smajstrla V,et al. Water exchange is the least painful colonoscope insertion technique and increases completion of unsedated solonoscopy. Clin Gastroenterol Hepatol 2015;13:1972-80.e1-3. Leung FW, Harker JO, Jackson G, Okamoto KE, Behbahani OM, Jamgotchian NJ,et al. A proof-of-principle, prospective, randomized, controlled trial demonstrating improved outcomes in scheduled unsedated colonoscopy by the water method. Gastrointest Endosc 2010;72:693-700. Luo H, Zhang L, Liu X, Leung FW, Liu Z, Wang X,et al. Water exchange enhanced cecal intubation in potentially difficult colonoscopy. Unsedated patients with prior abdominal or pelvic surgery: A prospective, randomized, controlled trial. Gastrointest Endosc 2013;77:767-73. Leung FW, Mann SK, Leung JW, Siao-Salera RM, Guy J. The water method is effective in difficult colonoscopy-it enhances cecal intubation in unsedated patients with a history of abdominal surgery. J Interv Gastroenterol 2011;1:172-6. Vemulapalli KC, Rex DK. Water immersion simplifies cecal intubation in patients with redundant colons and previous incomplete colonoscopies. Gastrointest Endosc 2012;76:812-7. Robertson DJ, Lieberman DA, Winawer SJ, Ahnen DJ, Baron JA, Schatzkin A,et al. Colorectal cancers soon after colonoscopy: A pooled multicohort analysis. Gut 2014;63:949-56. Cadoni S, Falt P, Sanna S, Argiolas M, Fanari V, Gallittu P,et al. Insertion water exchange increases right colon adenoma and hyperplastic polyp detection rates during withdrawal. Dig Liver Dis 2016;48:638-43. Mizukami T, Yokoyama A, Imaeda H, Kumai K. Collapse submergence methods: Simple colonoscopic technique combining water infusion with complete air removal from the rectosigmoid colon. Dig Endosc 2007;19:43-8.
le Clercq CM, Bouwens MW, Rondagh EJ, Bakker CM, Keulen ET, de Ridder RJ,et al. Postcolonoscopy colorectal cancers are preventable: A population-based study. Gut 2014;63:957-63. Calderwood AH, Lai EJ, Fix OK, Jacobson BC. An endoscopist-blinded, randomized, controlled trial of a simple visual aid to improve bowel preparation for screening colonoscopy. Gastrointest Endosc 2011;73:307-14. Shah SG, Brooker JC, Thapar C, Williams CB, Saunders BP. Patient pain during colonoscopy: An analysis using real-time magnetic endoscope imaging. Endoscopy 2002;34:435-40. Leung JW, Thai A, Yen A, Ward G, Abramyan O, Lee J,et al. Magnetic endoscope imaging (ScopeGuide) elucidates the mechanism of action of the pain-alleviating impact of water exchange colonoscopy-attenuation of loop formation. J Interv Gastroenterol 2012;2:142-6. Leung J, Mann S, Siao-Salera R, Ransibrahmanakul K, Lim B, Canete W,et al. A randomized, controlled trial to confirm the beneficial effects of the water method on U.S. veterans undergoing colonoscopy with the option of on-demand sedation. Gastrointest Endosc 2011;73:103-10. Calderwood AH, Thompson KD, Schroy PC, 3rd, Lieberman DA, Jacobson BC. Good is better than excellent: Bowel preparation quality and adenoma detection rates. Gastrointest Endosc 2015;81:691-699.e1. Cadoni S, Falt P, Sanna S, Argiolas M, Fanari V, Gallittu P,et al. Impact of colonoscopy insertion techniques on adenoma detection. Dig Dis Sci 2016;61:2068-75.